Today while running errands I opted to take the “scenic route” home. I decided to enjoy access to our waterfront! As you can see, I was not alone. Not surprisingly, the park bench— or would that be former park bench— is still in the East River. That has been its location for almost two months. Can I honestly say I am surprised by this? No— but it did get me to thinking. I have reached the conclusion I am looking at this all wrong. This is not an eyesore, it is an opportunity to give a nod to our community’s industrial heritage! 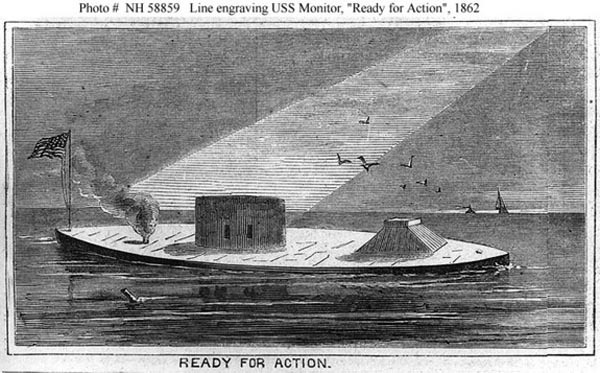 This pop-up park is located within eye shot of the USS Monitor’s launch site (as indicated by the top most arrow). I propose a metal worker (or two) be hired to retrofit this piece of seating with some armor and a turret. Lo, instant public art! Is anyone with me on this? Photo Credits: “Ready For Action” comes courtesy of LiveScience.com. They have a nifty array of Monitor photos old and new. Check ’em out!